Choosing the perfect gift for a loved one, friend or colleague can be a difficult task. Enter the Christmas hamper selection from artisan food marketplace, Yumbles. Does anything scream festive celebrations more than a basket or box packed full of tempting treats and tipples? Hampers are a fabulous gift, especially as there are so many options out there in terms of product selection and style. With so many to choose from, it may be overwhelming to decide which is the right one for you, so we’ve done the hard work for you. If you’re a chocolate lover, Christmas is definitely up there with one of the best times of year. This particular hamper is for the person in your life that takes chocolate seriously, and only the best will do. Made up of a whole host of handmade chocolates, with flavours such as sea salt caramel and chocolate popcorn to name just a couple, it’s a must have for the chocoholic. Bursting with a seriously impressive selection of indulgent and decadent vegan goodies, this hamper come beautifully presented in a wicker basket and contains everything from chocolate peanut butter cups to Chilli and Lime Potato crisps, and everything in between. Explore a range of vegan hampers at Yumbles. Gin is well and truly having a moment, and we for one are thrilled. For the ultimate gin connoisseur, the Gin O’Clock hamper comes complete with a bottle of artisan Elderflower gin, Indian tonic waters and a whole host of gin themed goodies including gin fizz gummies. The Happy Healthy hamper is packed full to the brim of energising raw food, for the healthy among us. Everything from exotic fruity bites to Cashew nut butter are included, not forgetting the passionfruit macaroons! We’re pretty sure that everyone will have at least one member of the family that’s an absolute cheese fanatic, and this is the hamper for them! Complete with vintage cheddar, oak smoked cheddar, fruit cake, biscuits and chutneys, you’re good to go with this one. An absolute delight! The gluten free hamper contains everything you need to celebrate the festive period in style, with the likes of a gluten free iced Christmas cake, and Christmas chutney to name just a couple of products. 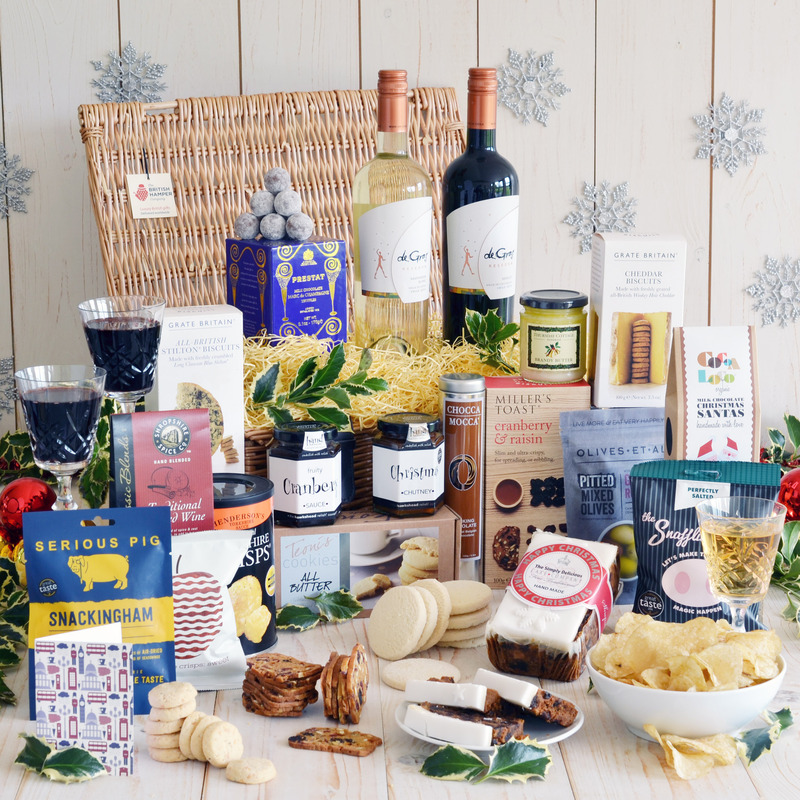 Absolutely everything you could ever possibly need to celebrate Christmas, all in one hamper. The ultimate festive celebration hamper includes everything from excellent wines, to Christmas cake, chocolates, homemade brandy butter and so much more.